This walk: 2015-8-6. 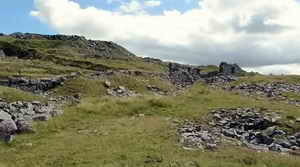 Four Winds car park, King's Tor, logan stone, Swell Tor Quarry, corbels, smithy, Merrivale Longstone, cairn, stone circle, double stone rows, cists. OS 6-inch 1888-1913 - very good - look also at Foggintor. Previous walks in this area: 14 July 2010 and 23rd July 2010. Inside the Four Winds car park area - this was the site of Foggintor School, built in 1914, having about 55 children from the local quarries. It was closed in 1936, becoming a private house thereafter, aptly called Four Winds. It was finally demolished in 1965. Before the school was built, Foggintor Mission Hall was used. While it was a school, with just the one headmaster, Fred Stoyle, who was the youngest headmaster in the country, it had a garden with bees, poultry, goats and rabbits. His wife, Mrs. Stoyle, taught the younger children. The children played football on a moorland pitch and warmed their pasties on central heating pipes! The Stoyles' son, Ivan, took the school Christmas tree into the garden in 1924 and planted it, this is the tree you see today - in this photograph! At the rear of the Four Winds enclosed area - the Long Ash Leat. Great Mis Tor, SX 563 769, elevation 538 metres (1765 feet), with Little Mis Tor to the right and the Four Winds car park. On reaching the old GWR track bed, originally opened n 1823 as the Plymouth & Dartmoor Railway (a horse-drawn tramway). View to Merrivale Quarry with (from left) Middle Staple Tor, Great Staple Tor and Roos Tor on the skyline, and with Cox Tor behind (at left).. Ruins of a linesman's hut, at SX 55477 73986. The location at which the old P&DR and GWR tracks parted company: the P&DR horse-drawn wagons came around King's Tor with a relatively sharp bend that steam locomotives could not do - they came through the new cutting. The tramway is towards the right side of the view. Showing the difference in levels of the two railway tracks at this point - old P&DR (left, heading to Swell Tor Quarry) and GWR (right) - looking south-east. House ruins on the west side of the track, at SX 55697 73237. A general panorama looking at the extensive working area of Swell Tor Quarry from near the track. Hmmm ..... they've missed the train! 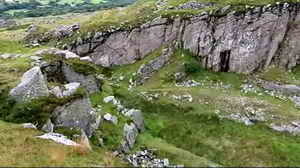 A panorama looking down into the outer quarry. A panorama looking down into the inner quarry and panning right, past Yellowmeade Farm, around to Foggintor Quarry. Overview of the inner quarry. Click on the image to see a larger version. 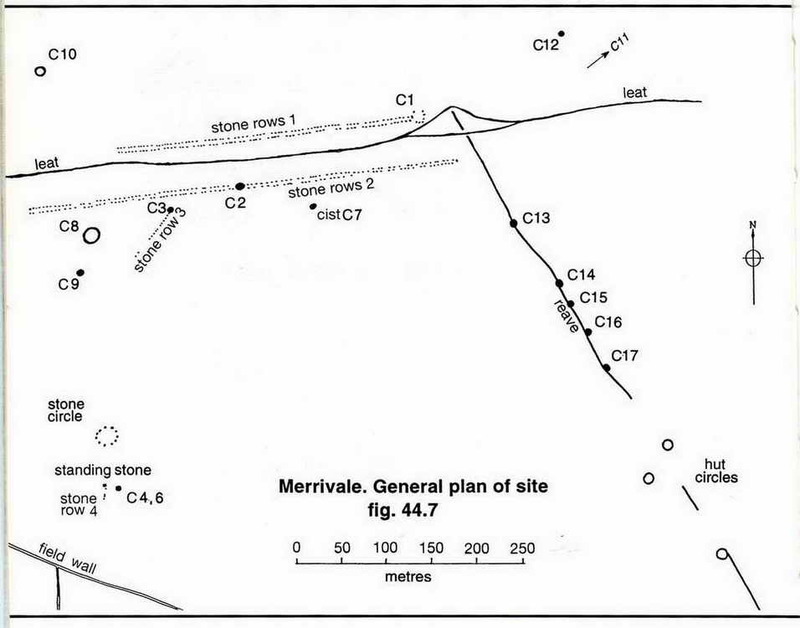 The Merrivale Bronze Age features below are described in Jeremy Butler, 1994, Dartmoor Atlas of Antiquities Vol. 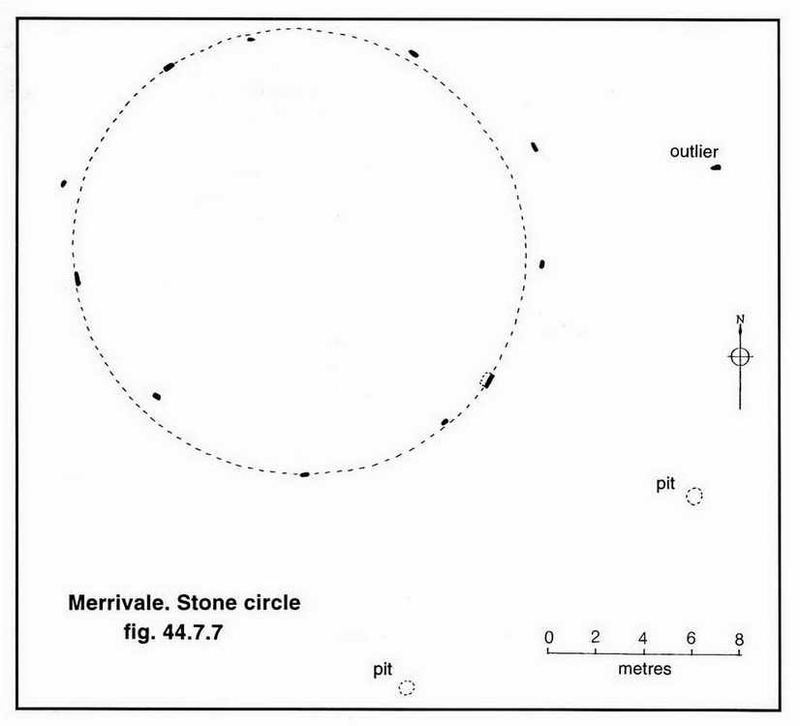 3 - The South West, 8 - Merrivale ceremonial centre, pages 23-32. 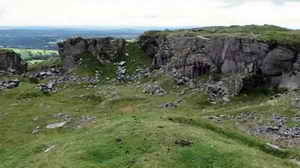 View with Foggintor Quarry in the background. Notice in the Four Winds car park. Click on the image to see a larger version. The walk was accessed via the B3357 Tavistock-Two Bridges road. 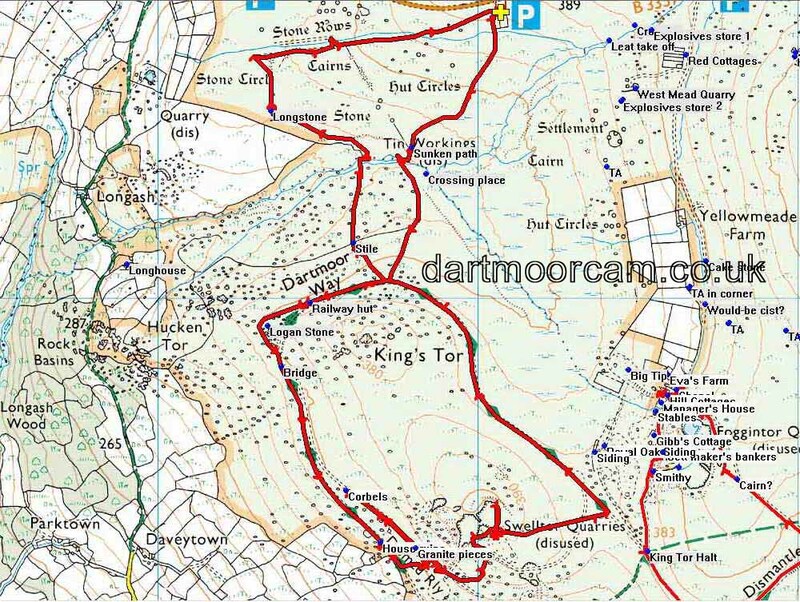 There are three easy car parks indicated on the map by the P symbol, travelling from Tavistock the first one is on the right just after the Dartmoor Inn, followed by a larger one at Four Winds (surrounded by trees, marked with the yellow cross) and the third is a small quarry seen at thr turning into the lane to Yellowmead Farm. Distance - 7.5 km / 4.66 miles.